We offer a full range of PADI diving courses. From the entry-level open water course all the way through professional level divemaster courses. You can rest assured that whichever course you take with us will be fun and safe and taught by our group of the most experiences and well respected instructors on Koh Samui. We have full-time instructors who can teach fluently in English, German, French, Chinese, Cantonese, Japanese, Italian, Spanish and Thai. Whether you are a first timer or looking to expand your skills and knowledge base we have the right PADI course for you. Our dive center is the premier 5-Star PADI center for diving Koh Samui, offering the highest quality of service for reasonable prices. This center offers a full range of PADI courses taught in multiple languages from Bubblemaker, Discover Scuba diving, and open water diver up to professional level divemaster training. We realize that it is YOUR vacation and usually can accommodate any request for courses or certified divers to go to the location you want to go on the day you want to go, with the type of boat (tour boat or speedboat) that you want to go on. We offer a full variety of PADI course from the beginning scuba diver course all the way to professional divemaster. We have the most experienced full-time instructors on the island and teach courses in English, German, French, Chinese, Cantonese, Italian, Spanish, Japanese and Thai. We have a perfect safety record in 14 years of business. Dive center has 3 custom built speedboats. This allows taking divers and snorkelers to all the best locations in the Gulf of Thailand quickly and in comfort. With the fastest travel times on the island, it allows our customers to spend more time in the water and to be back to Koh Samui mid-afternoon. All of the speedboats are equipped with first aid, toilets, and a full assortment of soft drinks and water complimentary. The number of divers on boats are limited so that the boat is never overcrowded. This is a 2-day course where you will learn basic dive theory and then get to experience 2 training dives in the open water. After completing this course you will have a certification to dive to 12 meters under the supervision of a divemaster or instructor. Your first day will start between 9-10 am when we will pick you up at your hotel and take you to dive shop at the Amari Palm Reef Hotel. You will start by watching the first part of the PADI open water DVD and then going over dive theory with your instructor. After the theory portion of the day, you will break for lunch and then off to one of our on-site pools. You will do 3 confined water dives with your instructor where you will learn how to use scuba equipment and learn and practice skills to make you competent and safe in the open water. Your first open water day will start with us picking you up at your hotel approximately 7:10 am. We will take you to the boat pier where you will meet up with your instructor and set up your equipment on the boat. The boat ride to Koh Tao will take approximately 1:15 minutes and upon arrival there you will do your first dive in one of the shallow bays of the island. In between dives you will enjoy some lunch and rest up for your second dive. After your second dive, the boat will return to Koh Samui and usually returns about 3:00 pm. This diving course can be completed in 3 or 4 days and at completion results in a certification to dive to 18 meters anywhere in the world. The course consists of 1-2 days of confined water training and dive theory and then 2 days of 4 exciting open water dives. We can offer many options of how you would like to complete your PADI course. The course can be completed in 2 ½ days with e-learning and up to 4 days with the standard course. Also, if you like to take a break you don’t have to complete the diving course on consecutive days if you’d like a little breather in between. The course consists of dive theory, confined water training and 4 dives on a boat in the open water. The PADI advanced open water course can be completed in 2-3 days and consists of 5 adventure dives. Two of these will be a deep dive and a navigation dive and then you get to choose 3 more dives from 15 available adventure dives including wreck and diver propulsion vehicles (underwater scooters). 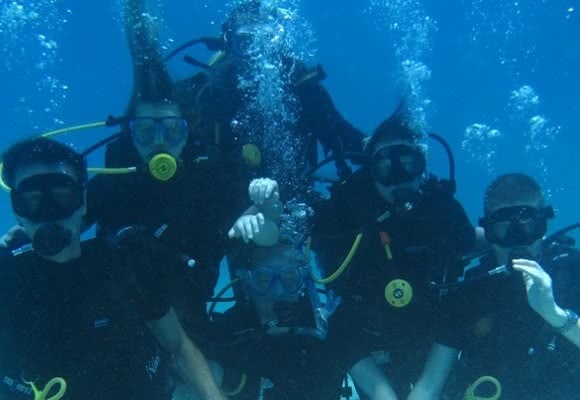 A very fun course and will greatly improve your scuba diving skills. First, you will choose your 3 elective adventure dives after consultation with one of our instructors. For each of the 5 adventure dives that you complete for the course, you will have to read the chapter in the PADI Adventures in Diving manual and fill out the corresponding knowledge reviews, or we can send you a PADI e-book so that you can do your reading at home before arriving here in Koh Samui. The course consists of 2-3 days of boat dives depending on which package that you choose. This is a really fun course and after completion, you will be certified to dive to depths of up to 30 meters. We will pick you up at your hotel at approximately 7:10 to take you to the boat pier. At the pier, you will review your dives for the day with your instructor discuss what you will be doing on the day’s dives and any preparation you may need. You will arrive at your first dive site between 8:50 and 9:20 depending on which dive site you and your instructor have chosen for the day. You will complete 2 or 3 dives during the day with lunch in between and then will return to Koh Samui between 1:15 and 2:30. After your dives, you will review your knowledge reviews with your instructor and debrief the dives for the day. Day 2 will run pretty much the same as day 1 as far as the schedule. After your dives, you will return to the shop again to finish your knowledge portion and process your PADI advanced open water certification. We also offer an advanced open water + nitrox certification course. This course is great if you plan on using your advanced certification to do deep diving or liveaboard in the future as being certified to use nitrox can greatly extend your bottom time on dives. 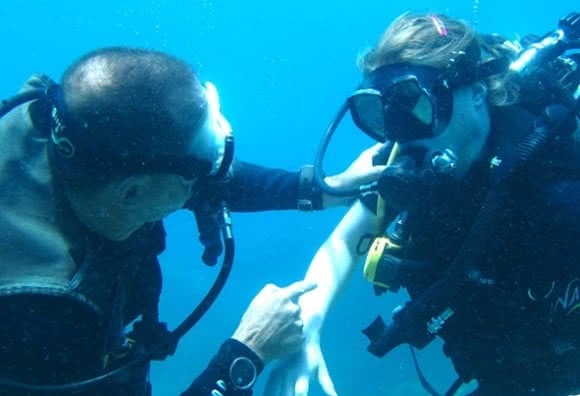 These specialty courses consist of 3-4 open water dives and will greatly improve your skills. In addition, each specialty counts towards your ultimate goal of a PADI master scuba diver which is the highest non-professional PADI rating. Rescue diver is maybe the most rewarding and challenging course of all the non-professional courses. You will spend 2-3 days learning skills to be prepared to help yourself in case of emergency and to help other divers in time of need. The rescue diver course will greatly improve your confidence in and out of the water and make you a better scuba diver. This course will give you skills for self-rescue, recognizing and managing stress in other divers, emergency management, and equipment, rescuing panicked divers and rescuing unresponsive divers. In order to complete your PADI rescue diver course, you will need to have a current first aid/CPR or emergency first responder certification. If you do not have one then you will need to take an Emergency First Responder course on the first day of your program. Our instructors are certified emergency first responder instructors so the course can be done on-site with our instructors. The first day of your rescue diver course will start at approximately 9:30 am and will start with the theory part of the course. You can save some time by taking advantage of PADI e-learning for this course. If you choose the e-learning then you will complete the theory portion of the course before you arrive at Koh Samui and then only will have to review theory with your instructor and then on to the skill set portion of the course. After doing some theory, you will go to our on-site pool for confined water training. Here you will learn valuable skills that you can use in case of emergencies in the water. Your second day of the course will consist of open water training. Here you will practice the skills that you learned in the pool in open water under real scenario situations. You will be provided with different emergency scenarios and will learn how to spot them and to handle them effectively using all of your skills and knowledge. After your open water training, you will finish any of the knowledge that you need to complete and have a debriefing of your dives with your instructor. This is your first professional diver certification. It a challenging and rewarding course which will take 4-12 weeks to complete. Upon completion of the course, you will be certified to lead certified scuba divers on dives and conduct certain PADI educational programs. The course consists of dive theory, leadership skills, water skills, and stamina exercises as well as others. Reviews for "Padi diving courses"
If you go elsewhere, blame yourself! With about 30-40 dives with Discovery Divers, I would be remiss not to review them on here. Despite the fact that we picked what was probably the worst time to go diving (monsoon AND full moon), they managed to find good diving for us every day. Pick up at the hotel is included in the price and this was extremely punctual. On the one occasion where the bus was running a few minutes late, I was sent an email to say that they were en route. On arrival to the pier, breakfast is served and anyone without their own gear is equipped. I used my own gear, but all the rental gear appeared to be either brand new or meticulously maintained. After a bit of paperwork it's off to the boats. Both boats are maintained to a high standard and are very fast - to the point where other outfits are only arriving on site for their first dive by the time we were gearing up for our second dive. Soft drinks are available throughout the day and lunch is served between dives. All the instructors are extremely welcoming and the dive briefings are very thorough. Everyone speaks several languages, so usually customers are briefed in their native tongue. They are also very adept at finding dive sites suitable for the experience level of the divers of the day - from first time divers to highly experienced divers. I got to dive with the same instructor (Steve) on almost all days and he was fantastic. Being a reasonably experienced diver, he was happy to take me on more adventurous dives and fingertip-searched half of the Gulf of Thailand, just to find me another new nudibrach. Thank you, Steve! FANTASTIC Dive Center - AND A Whale Shark!!! Staff and dive masters are very friendly, helpful, and thoughtful for every aspect of the dive. Very good at finding a pointing out fish. The gear is all very good and new. The crew took care of setting it up and breaking it down. We just enjoyed the dive (and their well-prepared lunch!). I went here with my daughters right before New Years, 2015 to go to Sail Rock. When we arrived, Eric sat us down and wisely said the waves there were large, and he "strongly advised" not to go that day, especially with kids. Very wise and helpful - it would have been hard. They then scheduled a special dive on Jan 1 (thanks!). We were the ONLY boat there, and a whale shark was as well! Man, our dive master was an EXPERT of finding the beautiful creature each time he came around. We also saw a very rare purple box jellyfish! They can't guarantee such great finds for everyone, but they were very good at helping find them. Thank you Discovery Dive Center for a great experience. My 17 year old son and I, both fairly experienced Advanced Open Water Divers (40+ dives each), visited Koh Samui and dived with Discovery. I booked the days from the UK and the reactions to the e-mails were swift, professional and friendly; we had a good impression before even meeting the team. On arrival at our hotel, we checked in with the Discovery shop to find they knew we were coming (experience has shown us that this is not always true elsewhere) and had a programme lined up for us for the 5 days diving that we had booked, that they were prepared to modify but there was no need. We were picked up from the hotel in a comfortable air conditioned minibus and on arrival at the Dive Centre checked out for kit size; efficiently this had already been picked out based on the info provided before arrival. There was tea, coffee, water to drink and sufficient to snack at for breakfast that we did not have to get up ridiculously early to squeeze in breakfast before leaving hotel. Our instructor/guide (Steve) introduced himself and we set off in a very well kept boat for some of the best diving experiences we have ever had. The visibility was excellent, the number and variety of fish was stunning and the care taken by Steve all week to ensure that we had the best time was exemplary. The dive centre provided all the kit that was required (thus cutting down on the luggage requirement for the holiday), and their kit was in excellent condition. The team were friendly, knowledgable, professional and fun to be with. The lunch provided was top notch and the drinks rolled to exactly the right temperature- particularly the beer after the second dive of the day! I cannot recommend this Dive Centre highly enough. The whole experience was excellent.